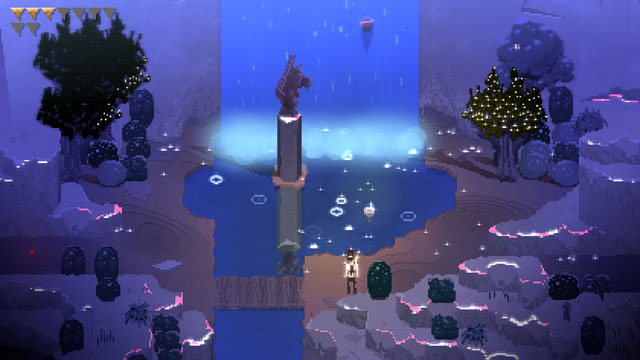 Songbringer is a sci-fi action-RPG from Wizard Fu Games, which offers a procedurally-generated overworld and ten dungeons packed with chunky pixel art and heavily inspired by The Legend of Zelda. The game may be played alone or with a friend in 2P co-op, as players explore the landscape in search of more powerful items and weaponry, as well as abilities that allow them to reach new areas. Players gain access to melee and projectile-based weapons as they take on varied foes, enemy swarms, and huge bosses. Dungeons require the player to solve puzzles to see his way through, with some even removing the player's sword until the dungeon is completed. The game is now available for PC, Mac, and Linux via Steam, Humble Bundle, and GOG, Xbox One via Microsoft Store, and PS4 via PSN. Check our coverage here.